Ideal for Trainee training. 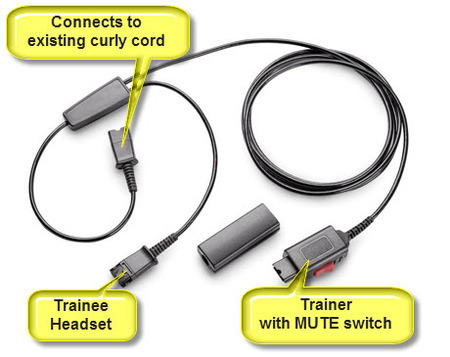 Quick Disconnect attaches to two Plantronics headsets (Trainee and Trainer). Only for use with Plantronics headsets. Use the training Buddy for other headset brands. Comes with in-line mute switch. Both headsets can listen, but only one headset have a live microphone at any one time. The other microphone is muted. The red toggle switch allows the Trainer to control which microphone is live and which is muted. Thus, he/she can take control of the call at any time.